This larger version of our My Grandma's granny smith apple coffee cake has two layers of fresh granny smith apples added to a cinnamon walnut sour cream coffee cake batter, which is then slow-baked to gently caramelize the apples. Try this with a scoop of vanilla ice cream. This three-pound one-ounce coffee cake serves approximately 16 - 20 and can be frozen up to four months. Kosher Certified and contains no trans-fats, artificial flavoring, artificial coloring or preservatives! 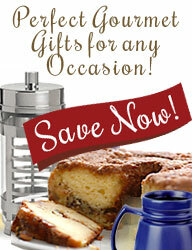 We're delighted to offer My Grandma's Granny Smith Apple Coffee Cake in both regular-size and large-size cakes! The apple doesn't fall far from the tree with this cake! CoffeeCakes.com Apple Walnut Coffee Cake uses a traditional rich sour cream coffeecake batter enriched with two layers of fresh granny smith apples. The coffee cake is then slow-baked in order to caramelize the apples. EXCLUSIVE CoffeeCakes.com Best Selling oDelish Brand Stroopwafels! Tastes and looks homemade. This all butter sour cream coffee cake is made the old fashioned way by hand by layering plump delicious apples into the batter. We use real butter and high end cinnamon and sugar to make the rich cinnamon streusel just right. Try this with a scoop of vanilla ice cream or warm this cake up slightly and melt some butter on top for a yummy gourmet treat! For best results, chill this hand-made coffee cake before slicing to prevent any crumbling. This 48 oz. (3lb) Handmade Apple Cinnamon Butter and Sour Cream Coffee Cake serves 12-16 people and comes in a beautiful tin that makes a very thoughtful and delicious gift. This Large Hand Made Apple Cinnamon Butter and Sour Cream Coffee Cake is shipped to you from our bakery deep in the heart of Texas.